Triple Threat is an honor given on WisSports.net to the top senior boys and girls three sport athletes in the state. At the end of the school year, those awarded with the weekly honor will be eligible for the Pat Richter Award, which will go out to the top boys and girls three sport athlete of the season. 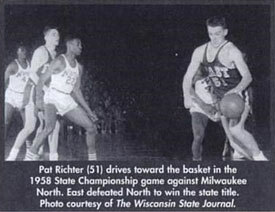 Hugh V. “Pat” Richter is one of Wisconsin's most-storied student-athletes in state history. He was a three-sport athlete at Madison East High School, competing in football, basketball and baseball. He was part of the Purgolders 1958 WIAA state basketball championship team as a junior. As a senior he led the Big 8 conference in scoring and was named the MVP. The team fell short of a repeat when they lost to the eventual state champ Milwaukee Lincoln in a sectional final 75-73. In football he caught 6 touchdowns on his career and booted 25 extra points for the Purgolders. In addition to lettering for East's high school baseball team he also played for the Monona Grove Lakers semi-pro baseball team. A University of Wisconsin graduate, Richter is one of only five men to earn nine varsity letters and the last person to earn such a distinction in school history. He lettered three times each in football, basketball and baseball. Richter was a two-time All-American selection in football as an end. He also earned All-Big Ten Conference honors as a first baseman. 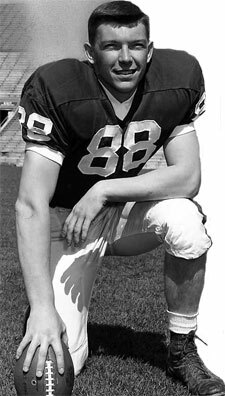 Richter led the NCAA in receiving as a junior and set a Rose Bowl record with 11 catches for 163 yards in the 1963 game against top-ranked USC. He was a first-round draft pick by Washington in 1963 and went on to play eight seasons in the NFL. Richter, who served with distinction as athletic director for 14-plus years at Wisconsin, has received an impressive list of honors during his career. He was named Wisconsin's Big Ten Medal of Honor winner (for academic and athletic excellence) in 1963. He was inducted into the Verizon/CoSIDA (College Sports Information Directors of America) Academic All-America Hall of Fame in 1995. He was presented with an NCAA Silver Anniversary Award in 1988 for post-collegiate accomplishment and was named to the National Football Foundation's College Hall of Fame in 1997. The University of Wisconsin–Madison twice honored Richter during the 2006 football season. On November 4, his number 88 was retired and on November 17 a statue of Richter was unveiled in the Kellner Hall plaza immediately outside Camp Randall.